Ready-To-Assemble Storage Cabinet With Five Shelves Offers A Sturdy, Private Storage Space To Keep Material Organized And Secure. Once Assembled, Lock Up Belongings Using The Recessed Locking Handle With The Three-Point Locking System. Durable Cabinet Is Made Of Sturdy Steel. Shelves Are Reinforced For Strength. Four Adjust In 3/4" Increments To Fit Your Storage Needs. Each Shelf Holds 180 Lb. Steel Construction Has A Powder-Coat Finish To Make It Last Longer. 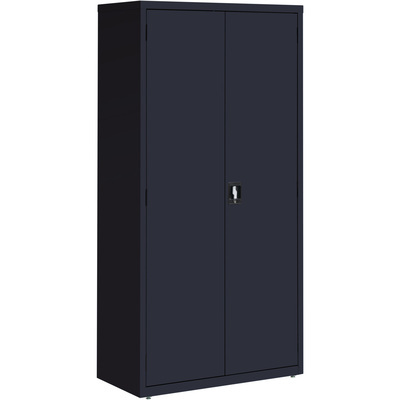 Cabinet Includes One Key And Meets Or Exceeds Ansi/Bifma Standards..
Ready-To-Assemble Storage Cabinet With Five Shelves Offers A Sturdy, Private Storage Space To Keep Material Organized And Secure. Once Assembled, Lock Up Belongings Using The Recessed Locking Handle With The Three-Point Locking System. Durable Cabinet Is Made Of Sturdy Steel. Shelves Are Reinforced For Strength. Four Adjust In 3/4" Increments To Fit Your Storage Needs. Each Shelf Holds 180 Lb. Steel Construction Has A Powder-Coat Finish To Make It Last Longer. Cabinet Includes One Key And Meets Or Exceeds Ansi/Bifma Standards.